Blue Lake Bush - One of the most popular varieties of bush beans. Mouth watering pods grow 6 inches long. Good fresh, canned, or frozen. Blue Lake Stringless Pole - Pole beans are great for a clean bean with an extended harvest period. Beans are dark green, smooth, with round pods that are tender and meaty. Provide plants with something to climb. Burpee's Stringless - Tender, crisp, and stringless pods. Ideal fresh, or for canning. Earliserve - This bush variety is a winner in taste tests, with a full, rich flavor. Stringless 4 inch pods are excellent fresh, canned, or frozen. Gold Rush Yellow Wax - This bean is 5 1/4 inches long. The yellow wax pod is straight and hangs in clusters for easy picking. Very popular with home gardeners. Freezes well. Gourmet Green Bush - here's a stringless bean with great taste. Try growing this flavorful, 4 to 4 1/2 inch bean in a container on your deck. Henderson Baby Lima - This small lima bean has a smooth and buttery flavor. It can be eaten fresh or dried, and is great for freezing or canning. Kentucky Wonder Wax Pole - This is an old fashioned heirloom variety. Beans rae 6 to 9 inches ong, slightly curved, golden yellow pods with brown seeds. Prolific producer of stringless, meaty pods. Lima Bean, Fordhook 242 Bush - This is a favorite variety with many home gardeners. It is tolerant to hot, dry weather. It is tasty fresh, canned or frozen. Livingston Sure Crop - Many who have tried this, call it the best bean for both home gardeners and professionals. High yield of 4 to 4 1/2 inch, crisp and tender pods, with a rich flavor..
Pencil Pod Black Wax - This stringless, yellow wax bean is long and round with black seeds. It is excellent fresh, frozen or canned. Roma Bush II - Flat, broad and smooth pods grow on an upright, bushy plant. High yields of tender, flavorful stringless pods. Royal Burgundy - Novel, purple, 5 - 5 1/2 inch bean pods turn green when cooked. Excellent fresh or frozen. Scarlet Runner Bean - This is known as an annual flowering vine to most gardeners. But, the young, tender beans are also edible. 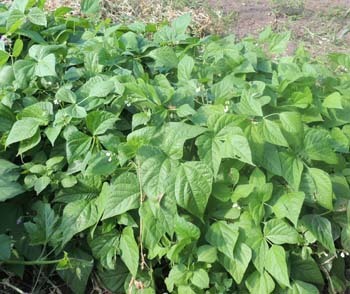 Slenderette Bush - Smooth, stringless 5 inch, dark green pods hold small, white beans. Tis variety is delicious steamed, stir-fried or blanched. Soybean - Edible soybeans are increasing in popularity for their high nutrition and protein. Can be eaten hot or cold. Try some in your garden this season. Tenderette - This bean variety is a top performer. Super rich flavor and excellent pod quality. Bears over a longer period of time than other beans. Stringless, straight pods with white beans are perfect for fresh eating, freezing or canning. Top Crop Bush - Developed specifically for home gardens. A meaty, tasty bean, on upright, early and productive plants. White Half Runner Mountaineer - This plant is known or its early maturity and heavy yield. Five inch pods are light green, round and tender, with a sweet flavor. This plants can be grown on a trellis, or as a bush bean.